The easiest adjustable wire shelving ever! Adjustable: Lift the release on each corner and adjust your shelf at precise 1" (25mm) increments in seconds. Easy Assembly: No tools, no wasted time and best of all, no wasted space. Improved Rigidity: Shelf releases and wedges have been reengineered for improved performance. Unique Design: Open-wire design minimizes dust accumulation and allows a free circulation of air, greater visibility and light penetration. 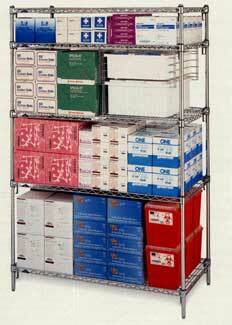 Super Erecta Site Select posts are fitted with adjustable leveling bolts to compensate for uneven surfaces. Special length posts are available.